The village with 300 chimneys is surrounded by pine trees, vineyards and hills. On the area of Albergue do Bonjardim, which covers about 28 acres, you can stroll through vineyards and the forest. You could also enjoy some wine on the terrace. (Claudia speaks English). On request you could also enjoy lunch or dinner which will be made using Sonia's passion for tradition. Rooms: There are 7 roomsfurnished in the Portuguese style. Some rooms have an extra room. Each room has a bathroom. It is not allowed to smoke in any of the rooms. The bathrooms will be cleaned every day. This large room is situated on the 2nd floor and has, on the opposite side of the landing, its own bathroom. The bathroom is fitted with a small bath, toilet, bidet and a washbasin. The room overlooks the whole Quinta and the mountains. This romantic room is situated on the 1st floor of the main building. The room has a large bedroom, with a small internal and external balcony, and a bathroom. The bathroom is fitted with a bath, toilet, bidet and a fitted washbasin. The room overlooks the garden and the main entrance. This room is situated on the 1st floor of the main building overlooking the wine-tasting area and vineyard. The room has a large bedroom, an adjoining room with extra beds (bunk beds for children up to 12 years) and a bathroom. The bathroom is fitted with a bath, toilet, bidet and a washbasin. This room is situated on the 2nd floor of the main building. The room consists of a large bedroom with and extra child's bed, an adjoining room with an extra bed and bathroom. The bathroom is fitted with a small bath, toilet, bidet and a washbasin. This room is situated in the wine-tasting garden. The former poultry house has a bedroom, bathroom with a bath, toilet, bidet and a washbasin. On request a small kitchen with dishwasher is available. This small cosy room is situated at the front of the former workers house. The bathroom is fitted with a shower, toilet, washbasin and bidet. This room, in the former workers house, has a front room with a wood stove, an extra bed and a veranda overlooking the mountains. 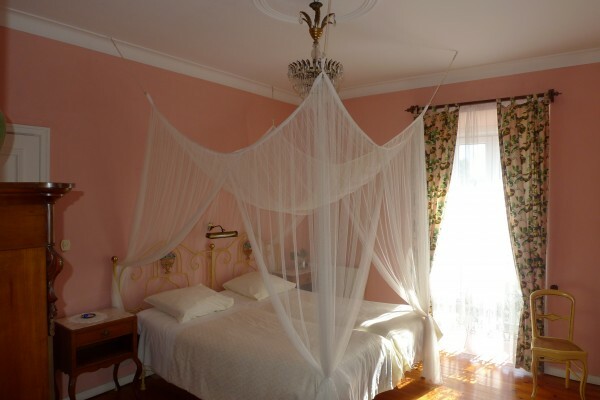 The bedroom has a wooden double bed with a mosquito net. The private bathroom is fitted with a bath, toilet, bidet and a washbasin. Besides the bedroom and the private bathroom there is a kitchenette in the room. 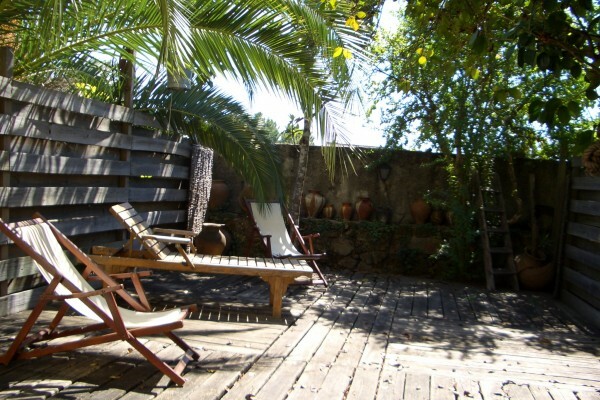 Apartment Casa do Alambique: This apartment has a distillery and is situated close to the wine cellar. It is a cosy but simple accommodation for a group up to 8 persons. It contains 2 double (bunk) beds, 1 single (bunk) bed, 2 single beds and 1 double room. There are two toilets and a shower and a complete kitchen. 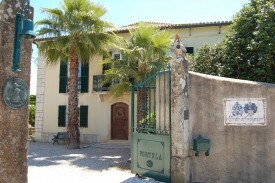 In the grounds there is ample parking space available for Albergue do Bonjardim guests, free of charge. Only payment by cash is possible. Breakfast: When the weather is fine, breakfast will be served outside. There are no set times. On request you could enjoy dinner which will be made using Sonia's passion for tradition. Enjoy a culinary evening outside with a glass of our organic wines. In the village nearby it's possible to rent bikes. The region is perfect for an adventurous bike ride. Allowed outside, not inside the house. Besides the wireless network you could use the PC that's available for guests in the bar. Did you stay in Albergue do Bonjardim? Let us know what you thought about it and help others to make the right choice! * I confirm having stayed in Albergue do Bonjardim. 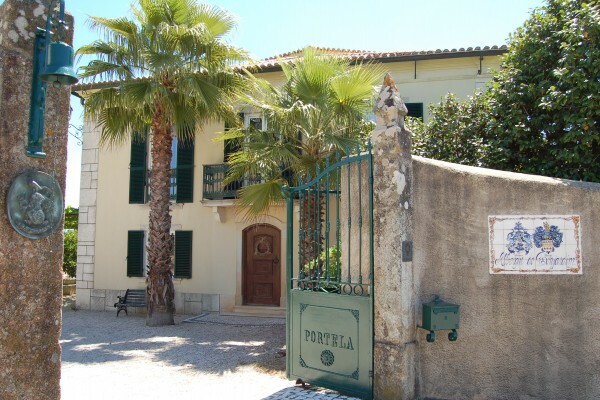 Find other bed & breakfasts in Sertã or all bed & breakfasts in Centro.